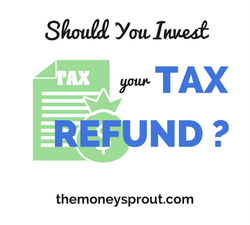 Should You Invest Your Tax Return? Should you invest your tax return this year? I certainly think so. While many people probably shutter when they think of doing their taxes, I get excited. That is because for the 3rd year in a row … our family will be investing our tax refund into dividend stocks. I know … I should probably adjust our withholding so that we don’t give the government a $5,000 interest free loan every year. We could likely keep more of that money from our paycheck instead of it going towards our taxes. The good news is that once we get our lump sum this year (a little over $6,000 for federal and state combined), $5,000 is going to be invested in assets that will generate more income! Yeah! Our preferred income generation tool is – dividend stocks. It was just 2 years ago (2015), when we invested almost $5,000 into dividend paying stocks and started to track the results. Those investments now provide our family with an additional $200+ of income every year. We followed up 2015 with another $5,000 investment from our tax refund in 2016 and plan to do so again in 2017. Let’s take a look at how our original investments from 2015 are doing. Back in April 2015, I wrote about how investing our tax refund would generate $200 of future annual income. We took $5,000 from our tax return that year and invested it into several dividend paying stocks. In total, we purchased shares of stock in 5 different companies between April (2015) and June (2015). For about a year, we tracked our progress from these funds. Our goal was to illustrate how investing a lump sum of money from a tax return could really help boost your dividend income portfolio. Even though we have not been tracking these investments on their own lately, it doesn’t mean they are not working hard earning income for us all year long. Note – All stocks were purchases from our Robinhood brokerage account. That means we did not pay any fees or commission to own these shares … nor do we have any dividend reinvestment. Since purchasing these stocks almost 2 years ago … most of them have been at work for us earning dividend income. The only stock that we no longer own are the shares of BHP Billiton (BHP) … which we sold after a dividend cut. Note – In 2 years, we have earned back approximately 8.2% of our investment in dividends alone. As you can see from above … we have created a nice income stream that pays us over $200 annually. The past is not a guarantee of the future … but it can be used to help predict what could happen. With the exception of our BHP Billiton (BHP) shares, the other 4 stocks we purchased have all increased their payouts since 2015. That is the great thing about investing in quality dividend stocks … most of them keep giving you a raise year after year. So if each of the companies listed above maintain their dividends, we will be guaranteed $219.47 in extra income every year. The total future dividend income estimates above don’t include any BHP Billiton (BHP) shares, since we no longer own them. We ended up taking about a $200 loss on selling these shares. The funds from the sale have been used to invest elsewhere but are difficult to track now for the tax refund portfolio. Also, the estimates above don’t include any kind of dividend reinvestment into new shares of the $400+ we have earned. Since we don’t have DRiP setup for these stocks, we don’t have an easy way for tracking those reinvestment’s. The bottom line is that we are earning even more than estimated on these funds. Finally, what I love about dividend stocks is that there are two different ways to profit. First, as mentioned above, we have earned over $400 in dividend income from these investments. Second, we are also building our wealth as the value of these shares rise overtime. The value of these shares (plus the sale of the BHP stock) are currently around $5,125. Not a huge increase … but combined with dividend income earned … it has been a successful investment. Full Disclosure – At the time of this writing, I owned shares in the following stocks noted in this post – CAT, EMR, O, and OHI. The material above is not a recommendation to buy. Please do your own research on a company before deciding to invest.